With rain on the cards, drivers were keen to get out of the garages early and set lap times in each session as soon as possible. It didn't work out for Lewis Hamilton at the start, who found himself out of qualifying due to a huge fire, and it didn't work for Kevin Magnussen at the end, who found himself in the barriers after the weather did turn damp. Between those two incidents, there was plenty to behold, as the scrap for good starting positions got underway. Mercedes may have ended up on top but it was a good fight and set up a good grid for tomorrow's race. 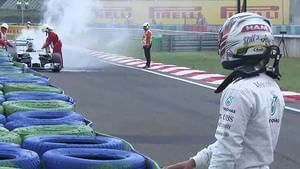 Lewis Hamilton out of qualifying after car fire in the first session. Kimi Räikkönen drops out after Q1, as Jules Bianchi gets through to the second session. The rain moves in for the final session, making a slippery surface. Q3 red flagged after Kevin Magnussen crashes into the barriers. Rosberg secures pole position ahead of Vettel, Bottas and Ricciardo. Hello F1 friends, how have you been in the... ooh... six days since we last spoke? Back to back races mean it's time already for the Hungarian Grand Prix weekend. Today is all about qualifying and I'm here to guide you through each session, picking out the key highlights if you're watching live and making a useful reference if you're looking back later. There's rain forecast for both Saturday and Sunday, but most are thinking that today's storm won't hit until after the qualifying sessions have been completed. We've got half an hour until the lights go green, so still plenty of time for that to change though. Tweet from @JennieGow: Should be a fascinating quali session. Lewis has lost out to Nico on the last 5 race weekends - can he turn it around? Hamilton has gotten off to a good start, leading all three practice sessions here in Hungary. We always talk about Mercedes, though, let's look elsewhere. Red Bull appear to have picked up the pace a little bit again, and Sebastian Vettel is finally getting to grips with the new style of car. Christian Horner on the two drivers: "Firstly, Daniel has done an incredible job, he’s exceeded all our expectations. I think he’s been a surprise to everyone… Seb has struggled with the car this year, he’s just starting to find a window of performance he can work with. He’s looked a lot more comfortable this weekend, hopefully he can have a good qualifying and they’ll both be right up there." Williams are still on the up and up, having snatched third place in the constructor's championship after the last race in Germany. They now have a five point lead over Ferrari, which is something deputy team principal Claire Williams says they couldn't have imagined this time last year. 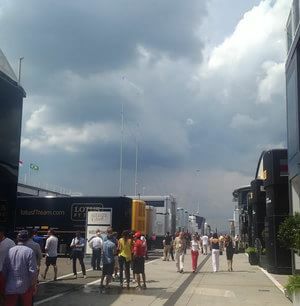 Dark clouds are moving in over the track though, could there be rain in the air? Pirelli predicted a two-stop strategy for the race tomorrow, but were keen to see what happened in practice. They haven't changed their minds after seeing the sessions yesterday, with motorsport director Paul Hembery saying: "We’re satisfied that the medium and soft tyres are working as we expected them to in Hungary, which is a circuit that can actually work the tyres quite hard despite the fact that it is low speed, especially if the set-up is not quite right. We’re seeing about 1.6 seconds between the two compounds at the moment, and this is likely not to change much, especially as the soft tyre in particular was showing low levels of thermal degradation." The engines roar, cars leave the garage and drivers get their qualifying campaigns underway. We're seeing the majority of cars out on the medium compounds, except the two Caterham drivers who have debuted on the softs. Within minutes, 15 cars are out on track, presumably as strategies remain cautious about the weather. Pastor Maldonado has come to a halt at the side of the track, after a puff of white smoke from the rear of the car. The first lap time on the board is from Kamui Kobayashi, with a 1:28.755, Marcus Ericsson slots in behind. For reference, pole position last year was 1:19.388 set by Lewis Hamilton, who went on to win the race. There are flames pouring from the back of the Mercedes as he desperately tries to get back to the pit lane. He parks at the entrance of the pit lane and quickly exits the car. Extinguishers at the ready as the huge flames are put out very quickly. The marshals got into action very quickly. Team radio on the replay shows Hamilton being instructed where the marshals were waiting for him, but the driver slightly concerned that the car wouldn't stop! Wires and all sorts burned through there, no doubt. With Hamilton and Maldonado likely out of the session, there's a real chance for Caterham or Marussia to make progress on the grid today. Poor Lewis Hamilton, he steps away from the car but looks back wistfully. As he turns to head back to the garage, there's an actual facepalm action from the Brit. Or more, helmetpalm, I suppose. The session is still ongoing, then, with about seven minutes left on the clock. Nico Rosberg has topped the times, but Daniel Ricciardo is just a tenth of a second behind. Romain Grosjean is currently in the drop zone, which has allowed Kobayashi to sneak up to 16th place. There's room for manoeuvre at the rear of the grid here. It's that quiet time where most head back to the garage for some quick tweaks, and then back out for their final attempt at a time. Grosjean crosses the line to improve to eighth place, that's dropped the four backmarkers into the drop zone. Nico Hülkenberg is sitting 16th, with Kimi Räikkönen only 15th. The track appears to be getting much quicker now, particularly as the runners on track have bolted on the soft compound. Jean-Éric Vergne tops the times with a 1:24.941. Nico Hülkenberg, on the tipping point of the drop zone, was on a hot lap but ran wide at the final corner. He'll have to go again. Max Chilton is running very slowly out on track, the car sounding pretty sick as he tries to get back to the pit lane. A fuel pressure problem, according to Marussia's radio. Hülkenberg's second attempt went much better, he improved to 12th place. Jules Bianchi crossed the line for a super lap, and moved up to 16th place, dropping Kimi Räikkönen out! 17th for the Ferrari driver, who watches on from the garage. The fastest three in that session were Jean-Éric Vergne, Nico Rosberg and Daniil Kvyat. Toro Rosso sandwich for Nico there. It was so close between Bianchi and Räikkönen but a bad call from Ferrari not to go out for a final lap. Plenty of drivers heading out early in this session again. Eight hit the track within the first minute or so. Fernando Alonso sits in the car, rubbing his nails across his helmet - either a little bit nervous, or a little bit blasé. The first lap times are on the board, with Daniil Kvyat setting the very early benchmark. He's soon dropped down by Felipe Massa, and then Valtteri Bottas. 1:24.001 the time to beat now, with Bottas half a second up on his teammate. Alonso splits the two Williams cars, but Nico Rosberg moves into the lead again, with a 1:23.210. The two Red Bulls are out warming up for their flying laps. Sutil reports he's suffering from a front locking problem, so they're going to try and move the brake bias to the rear and see if they can solve it. It's a good day for Sauber so far, with both drivers into the second session. Lewis Hamilton: "I bailed out of that timed lap I was doing. Something happened to my brakes, something on the brake system failed, I had to engage some settings to try and correct it and then the engine just died. I thought, I’m right next to the pit entry, I’ll roll back and try and get them to fix it. Then I looked in my mirrors and I was on fire. It was on fire, but I was still trying to get it to the garage, I thought maybe they could do something, but they said stop, stop, stop." Sergio Pérez is out of qualifying, as the car is being taken apart in the garage. Just five minutes left on the clock. The bottom six currently includes both Force India drivers, both Saubers, Romain Grosjean and Jules Bianchi. It's a hydraulic leak for Sergio Pérez, so he'll be 16th at best. Bottas looks super focused in the Williams. He's currently fourth, now that the Red Bull pair have moved ahead. A brief moment of calm as all the drivers return to the pit lane. But Felipe Massa breaks cover first for the final runs. Daniel Ricciardo is planning to save tyres for the race and not run again, happy with his time - third behind Rosberg and Vettel. And as expected, the top three are remaining in the garage, with everyone else (barring Sergio Pérez) out on track. Nico Hülkenberg improves to ninth place, dropping Kvyat into the bottom six. Kvyat is parked up off track, it looks like he's spun off after hitting the grass. The yellow flag will ruin most of the final laps. Grosjean, when informed of his 15th place position, responds: "So we couldn't even beat Sutil?" Harsh but fair. Another disappointed driver, as Kvyat stalks away from the car and back towards the pits and paddock. Helmet firmly attached for now. Despite his complaints, and the poor performance of the Lotus, Grosjean has one stat to be happy about. The rain has appeared! There are drops on the Toro Rosso as it is lifted away, and the umbrellas are being opened up amongst the crowds. Rosberg queues up at the end of the pit lane, first of a heap of drivers, as all want to get out and get that banker lap in before the rain comes down heavily. Team radio to Jean-Éric Vergne: "The rain is changing very quickly, Jev, so make sure we get this one clean lap." All ten drivers are out on track, Rosberg leading the two McLarens, with Massa and Ricciardo following. Alonso, Bottas, Vergne, and Hülkenberg are next in line, with Sebastian Vettel bringing up the rear. Huge crash for Kevin Magnussen, off into the barriers, sideways on, and the session has been stopped. Magnussen climbs out of the car looking sprightly enough, and he walks away fro the car as they move in to recover the stricken McLaren. There were brief yellow flags for Nico Rosberg, who braked and ran off at the first corner. Magnussen followed him in but couldn't avoid the barriers. Button almost did the same thing, with the first three drivers running wide at that corner. Team radio from Jenson Button: "No grip at all, very scary." On the pit wall, there were some panicked strategists as the FIA official weather radar was not functioning. It's now available, to tell them how hard it's raining and for how long. The marshals have removed the McLaren and now are moving the tyre barriers back into position. Session will restart at 14:57. The clock has stopped at 9:59, so ten minutes on the clock for drivers to put in those laps. Nico Hülkenberg informs his engineers that it's turn one that is damp, the rest of the track isn't too bad, and so slicks are still the right call. Session restarts, with Nico Rosberg squeezing out ahead to lead the pack again. Lots of instructions being fed to Nico Rosberg, he's planning to do three timed laps and can't back off too much in the in and out laps, due to the time constraints. Rosberg takes turn one carefully but makes it and starts the first timed lap of the session. Tweet from @pirellisport: Re-start of Q3. It is apparently not wet enough for Inters, so they go out again on the Yellow softs. The rain has all but gone now, so Rosberg's initial time is quickly beaten by Ricciardo, and almost everyone else who crosses the line. Valtteri Bottas sits at the top of the timesheets for now, a 1:24.259 on the board. Fernando Alonso moves into second place, with Daniel Ricciardo third. Only for a moment, though, as Jenson Button takes third. Bottas heads back to the pit lane, as Ricciardo pops up in P2. Moments later, Sebastian Vettel improves to take pole position, a 1:23.415. That's a massive eight tenths over Bottas. Nico Hülkenberg goes fourth fastest, as Nico Rosberg jumps back up to P1. There are eight times on the board, obviously Kevin Magnussen won't be setting a time but we have yet to see Vergne's first attempt at a time. The Red Bull pair dive into the pits for their last minute pit stop. Vergne's first lap time puts him fifth fastest, but now there's talk about the rain coming back. All nine drivers are out on track as the session winds to its conclusion. Just about a minute on the clock and everything to play for. Jenson Button goes fourth fastest, and has plenty of time to get another lap in if he so desires. Bottas closes the gap to P1, settling into second by a tenth. Massa goes fourth fastest. Alonso, who feels like he always starts and finishes in sixth place, picks up the fourth fastest time... for now. Everyone that's on a lap can finish it. Vergne is back in the pit lane, currently sitting eighth. Nico Hülkenberg also dives back into the pit lane. He's ninth, so that's the bottom of the top ten sorted. Vettel improves to P1, but Rosberg is close behind. Pole position for Nico Rosberg with a time of 1:22.715. The top three face the waiting photographers, smiles all round. Post-qualifying press conference - Nico Rosberg: "Quali 3 was really a big challenge because the track was just changing all the time in the beginning. It’s difficult to judge how much risk can I take, how late can I brake. Managed to avoid crashing, for Kevin… it was just massively difficult down there and unpredictable, that can happen. From then on it was easier because it started drying again. Especially my last lap, I just managed to nail it." Post-qualifying press conference - Sebastian Vettel: "I think the nature of the track suits us a bit more, less straights. Historically we’ve always had a competitive car around here. Seems like we are a little bit closer but Nico’s last lap was quite good so the gap was quite big. Bigger than we were hoping for. If we get everything perfect and Nico has a bit of a wobble, we can have a crack. But it didn’t happen." Post-qualifying press conference - Valtteri Bottas: "I think a little bit of a surprise. We knew that Red Bull was going to be quicker here, and Mercedes as always. The nature of the track for us in theory is not the best, but we’ve been able to work really well as a team to bring some updates. We’re still missing some grip compared to other cars, but today was a really good day for us. Third and sixth for us, there’s a really good chance to get some points tomorrow." It's going to be a heck of a climb for both Kimi Räikkönen and Lewis Hamilton to get anything useful out of this weekend. The Hungaroring is known for being dusty offline and difficult to overtake at. Starting at the rear of the field, they can only hope for some chaos up front to assist them in getting into the points. 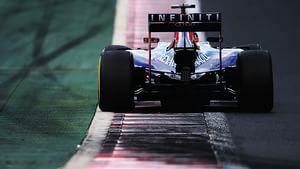 In the midfield, the Saubers did well and Daniil Kvyat was unfortunate in the timing of his spin. He looked like he was on for a good result, following his teammate into the top ten. You'd say that experience won out at the front, Rosberg ahead of Hamilton, Vettel ahead of Ricciardo, etc, etc. The one exception appears to be Bottas, who continues to get the better of Massa. Another second row grid slot for the Williams driver. All in all, we're set up for what has the potential to be a good race, but as it's Hungary, we won't get our hopes up too high. I recommend joining me back here tomorrow for lap by lap coverage of all the action for the Hungarian Grand Prix.